I love small town life for a whole host of reasons. The mom and pop businesses that dot the square and the main drag, the friendly greetings you get as you mosey about town, and neighbors helping neighbors. But who knew my small town would also host donkey basketball? Yep, it’s true. On a recent weekday night, darn near the whole town turned out at the local school gym for a rousing game of donkey basketball. We all piled into the gym, and the bleachers were a buzz as we watched local leaders, school teachers, and public servants line up as they awaited their wild rides. And in they came. Adorable donkeys of all sizes complete with rubber shoes. The hooting and hollering ensued as we all rooted for our favorites. Helmets on, the riders mounted their donkeys and began to pace up and down the court dribbling, carrying, and shooting basketballs. And just to be fair, I’m definitely using the word pace quite liberally here. If you’ve never spent much time around donkeys, what you might not know is that while they are smart and can be amazingly sweet, they definitely have minds of their own. This sometimes frustrating trait, made for a great night of entertainment. Here come the donkeys. This little guy was first to enter to whooping and hollering. Donkeys start the ceremony by carrying the littlest flag bearers. Line up under the hoops, the rider takes a shot and the donkey watches on. Sometimes the donkeys shed their riders. This poor fellow came off more than once but he was determined. So why in the world were donkeys playing basketball in our little town? Well for a good cause of course. Another part of small town life is the way folks are committed to helping each other, and this night the agenda was focused on kicking cancer (pun intended and emblazond on the t-shirts). The program started out honoring the cancer survivors, then the national anthem (and yes kids riding donkeys paraded around the flag), the pledge of allegiance, the Texas pledge (that’s how we roll around here), and a prayer. You can’t say we don’t take our events seriously. During halftime, a cake auction was held, and homemade goodies fetched hundreds of dollars for a great cause. It was one of those nights that just made me smile. When I came home and fed the horses and donkeys, I had a little chat with Sweetie Pie, our resident donkey. We talked it over, and while she was supportive of her fellow donkeys, she made it very clear in no uncertain terms that basketball was not in her future. I guess we’ll save the basketball hoops for another day. P.S. 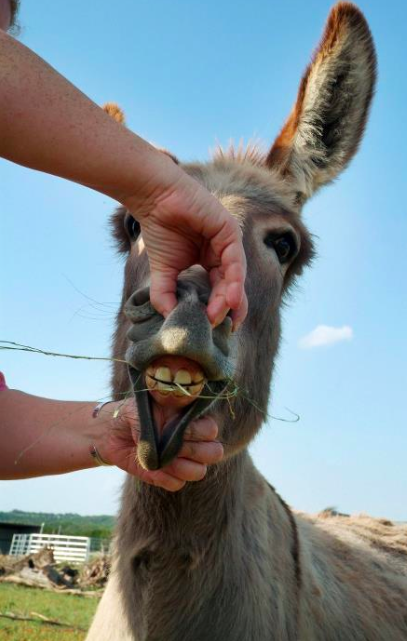 – No donkeys were harmed in the making of this blog.